Last Saturday morning I dusted off my ski crampons, lightweight ice axe, and my trusted lightweight ski mountaineering skis ... my sights were set in skiing the NNW Copper Mountain Couloir. I was not disappointed ... the skiing was phenomenal. However, I need to atone from my lack of blog posting activity ... thus on this posting I will try to play catch up with my friends and readers. I will come back to Saturday's ski tour with some pics, topo map, and tips when touring Copper's Mountain north drainage. Cinco de Mayo and Mother's day weekends offered a much slow pace than usual, and provided an opportunity to take a pause from skiing. These two weekends saw me spending time with Fritz and Lourdes, going to the movies, doing groceries, decompressing from the "tough" work environment, and just having high quality time with my loves ones. 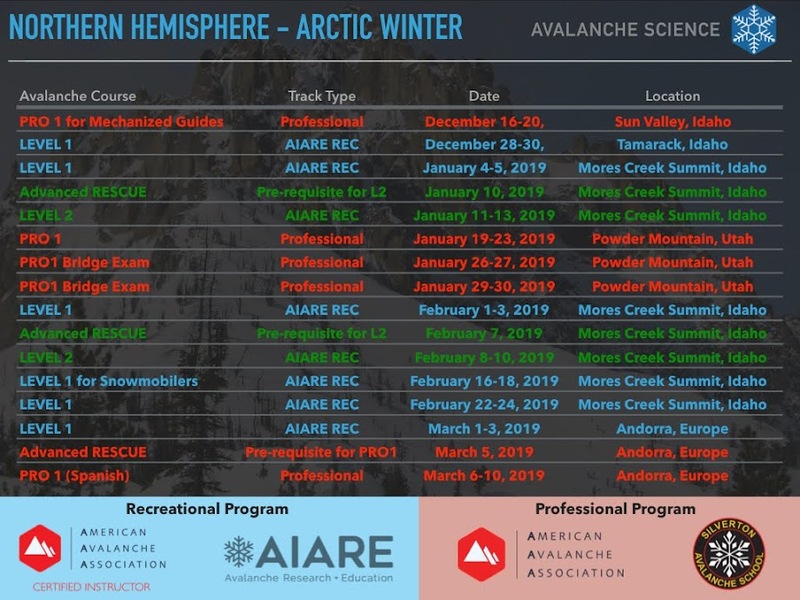 The month of April was really busy; skiing with Pedro during Berkeley's spring break, yurting and ski touring at Bench Lakes with Lanza's posse, and corn skiing "Rando's ridge" in the Mores Creek area. Pedro trying his new Tele gear while ski touring the Boise Front. In a previous posting I suggested naming a ridge south of Freeman after Rando Steve (TetonAT blogger). During April 21st, Brian B. and I thoroughly toured and explored the southern reaches of Rando Ridge. Notice that that the topo map for Rando Ridge has unnamed runs. Comments with alternative or new ski run names are welcome! Click on the image for larger view. The best access to Rando Ridge is to ski down into 12th mile Creek from Freeman Peak ridge. I will leave the trip report for April's visit to Bench Hut for another post to be published later in the week. To finish the month, the weekend of April 27-29th I visted Crystal Mountain Ski Resort. My good friend John Taggart and I attended the "NSP NW Region Education/Instructor Clinic and PNWD Skills and Drills on Advanced Terrain Clinic". This event was a fabulous opportunity to be mentored on Saturday by one of the best - Ross Bisshop - in the handling of toboggans in steep backcountry ski terrain. Sunday I joined the Patrollers Ski Improvement Workshop. I was lucky to have Kim Petram (Director of Fiorini Ski School at Snoqualmie) coach me during the whole day as we skied steep line after steep line under invogarating spring conditions. Crystal Mountain has some very cool terrain! Copper NNW Chute - The line I Skied. Copper North aspect - view from Snowmobile parking area. The snow conditions were typical for an early summer snowpack ... highly texturized and somewhat irregular surface, not the "orgasmic"classic corn skiing. However do not get me wrong, the skiing was fantastic, but it is essential to time the descent well to guarantee carvable soft snow turns. Definitely ski crampons are an asset to facilitate skinning and ascending in the morning hard snow. The snow coverage was pretty good down to the 7000 feet level at E, NE, N, NW aspects. Avoid S, SW, and W aspects since the snow line is approaching the 7500 and the coverage is thin. 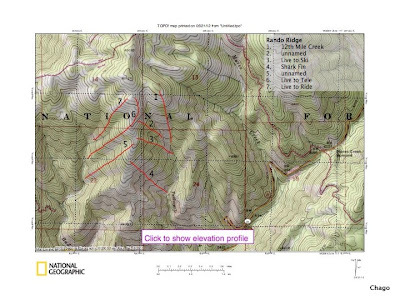 Next a topo map with a suggested route up to Copper's Summit that work pretty well for late May. Be mindful that this route is not child play (not recommended) during the winter months or Considerable/High avalanche danger conditions. To access Copper's north drainage park your vehicle at a small pull-out west of I-21 just before the bridge where the creek crosses the road from west to east. There is a small forest service rest area at this spot. 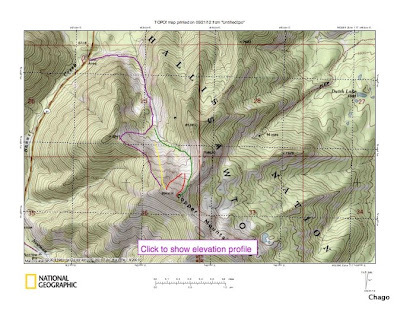 It is strongly suggested to follow the creek for the first mile or so as you ascend toward Copper Mountain. The purple route in the map was the course I followed last Saturday, but I have also skinned via the green route. The yellow trace in the topo map denotes the line I skied last Saturday, which is the best steep and sustained ski line at Copper. 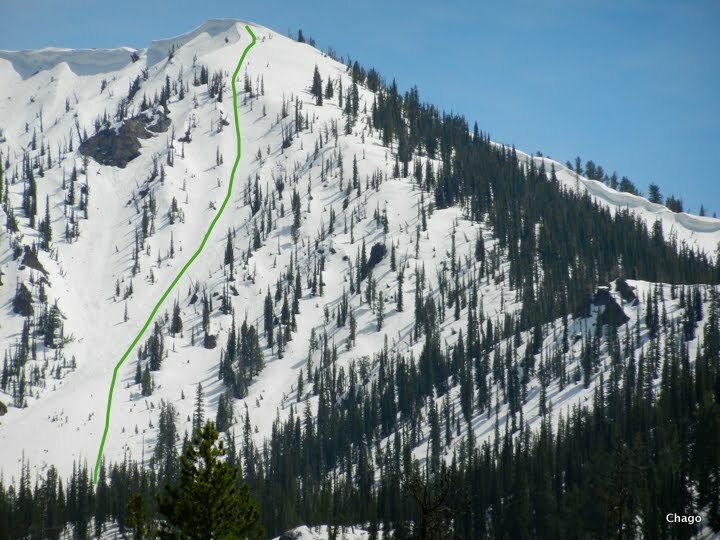 The red lines are in my opinion the second best lines, but 400 feet or so shorter than Copper NNW Chute I skied. These two alternate ski lines in red trace are best approached from the summit shoulders. After skiing, I camped at Stanley Lake. The plan was to ski Sunday morning the attractive McGowen's couloir. Saturday afternoon I hiked a couple miles on the inlet meadow to scout conditions. Unfortunately Sunday dawned cloudy, and the night cloud cover negated a much desired snow surface re-freeze. It did not make sense ski McGowen under a cloudy ski and poor snow conditions. It has been few years since the last time we had sufficient snow coverage to allow for June skiing in the Sawtooths, but it is looking very promising this year. It is going to be hard to choose among the many options; returning for more skiing from Stanley Lake and Iron Creek trailheads, the upcoming opening of Snowbank Road (Granite Peak), ski Gunsight and Lee couloirs at Anthony Lakes, or the opening of Chinook pass next weekend (East of Rainier).